We are looking for employees who are team players, enjoy the outdoors, are punctual, friendly, out going, hard working, energetic, enthusiastic, and professional, willing make a commitment to providing the best possible service for our customers. Our goal is to make happy rafters out of as many people as possible in the safest fun and efficient way possible. All employees must be 21 years of age and have at least three years driving experience with no more than two minor driving violations and be able to pass a physical exam as mandated by the Federal Department of Transportation. Must be able to type a minimum of 50 words a minute, with correct punctuation and spelling. The job duties include taking reservations in person, on the phone, or via e-mail with direct input into a computer database, greeting customers, answering the telephone, responding to e-mails, collecting money, selling miscellaneous items, and other computerized paper work as assigned. Knowledge of the Denali Park area, previous cash handling and reservation system experience a plus. This position requires a 40 hour work week. We require a clean driving record, a commercial driver’s license with a minimum of one year CDL, seven years general experience, ability to pass a drug & alcohol test, and have a current CDL physical. Must be able to drive a 44 passenger bus with a trailer on the back and be able to back up bus and trailer with accuracy. Responsible for local pickups and trip drop offs. Need a friendly disposition and ability to handle a hectic schedule. This position works a variable schedule ranging from 5 hours a day to 10 hours a day generally, forty to fifty hours a week. $15.00 per hour. We are looking for team players who are friendly, outgoing people that enjoy talking with people and that do not mind working long days. The job requires that each guide have past commercial rafting experience, prep and row three 2 hour trips a day, five days a week. The three trip times will vary daily depending on how many people are booked the night before. Other duties maybe assigned such as property and gear maintenance. Please e-mail us for job qualifications. Responsible for selling Alaskan Gifts, inventory and tagging of merchandise, selling and recording gift items, selling raft trips, keeping the store tidy, previous retail experience a plus. This position requires 40 to 20 hours per week. This job requires a clean driving record and ability to pass a CDL physical. Duties include part time driving of local shuttles in a commercial van. Job responsibilities are vehicle cleaning, raft & dry suit repair, property maintenance and other duties as assigned. Prior experience with raft repair is be a plus, but not required. Prior computerized bookkeeping experience required. The job requires excellent computer skills, experience with Quick-books or Accounting Edge computer software, expense categories, Payroll, Accounts Receivables, Accounts Payables, human resources. Alaska Jobs Location : Our housing facilities are located at mile post 230, 128 miles south of Fairbanks and 230 miles north of Anchorage on the George Parks Highway. The office is located at mile 238.5 about 3/4 of a mile north of the entrance to Denali National Park and Preserve. 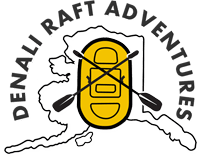 Alaska Jobs Crew Housing : Denali Raft Adventures, Inc. offers dormitory style rooms at $120 per month. Everyone gets a roommate. The condition of your room will be recorded when you check in. Damages to your room or any Denali Raft Adventures property will be deducted from your paycheck and is grounds for termination. Transportation: Starting from approximately May 20th, there is daily motor coach and railway service from Fairbanks to Anchorage. Most major airlines fly to Anchorage International Airport with connections to Fairbanks. If you have your own vehicle, the driving time from Anchorage is approximately five hours and approximately two hours from Fairbanks. Activities: Include white water raft trips, hiking and camping, limited fishing, berry picking in season, the shuttle bus wildlife viewing in Denali National Park and helicopter tours or flight-seeing tours around Mt. McKinley and the Denali Park area. Evening activities include dances, movies and slide shows.